This year (and every year, really) our Valentine's plans are fairly low-key. My husband usually has Fridays off (Sunday is definitely a work day!) so we usually prefer to make our "date-nights" during the day while the kids are at school. So, we'll be eating lunch out and probably hitting a movie, but Friday evening we'll have a family dinner together for Valentine's Day. The weather will finally be warming up here so we're planning to grill steaks and enjoy being able to be outside a bit also. 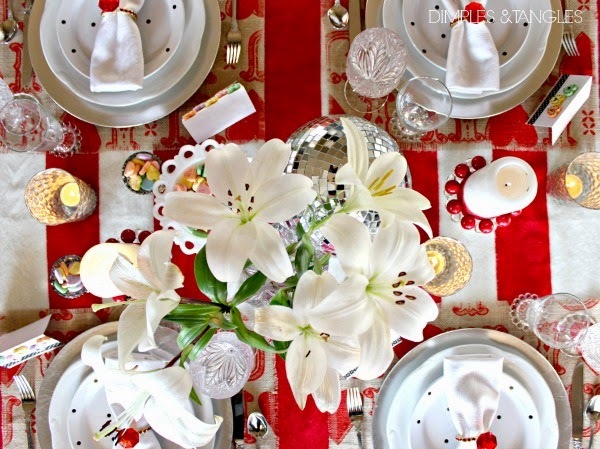 I put together a simple, casual yet festive table setting for our evening. Often it just takes one thing to inspire an idea for a tablescape for me. 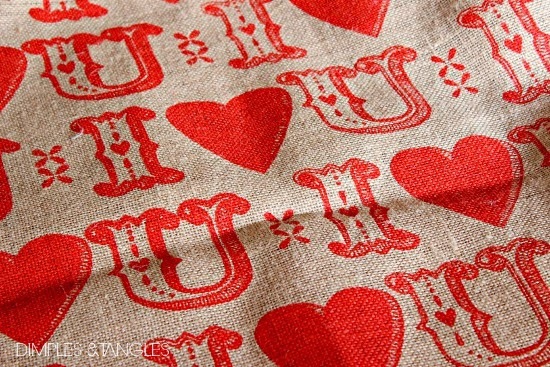 While at JoAnn's picking up the gold glitter transfer for our Valentine's shirt, I spotted this fun burlap. I bought a yard and thought using it as placemats would be a perfect starting place for the table. I just used a placemat I already had for a pattern to cut the size, then pulled off several rows of threads from each side to fringe the edges. Beware, working with burlap is a messy job! I remembered a red and white striped blanket (Target clearance) that I had tucked in the closet, and used it as a base to layer everything on top of. For place cards I used white cardstock, washi tape, and the large candy hearts attached with hot glue and labeled with a Sharpie. These candle rings have been in my Christmas stash for a few years. The berries are torn off of floral picks and then hot glued to a ribbon. I glued the ribbon closed, but left it a bit loose so I can slip it off and on a pillar candle. 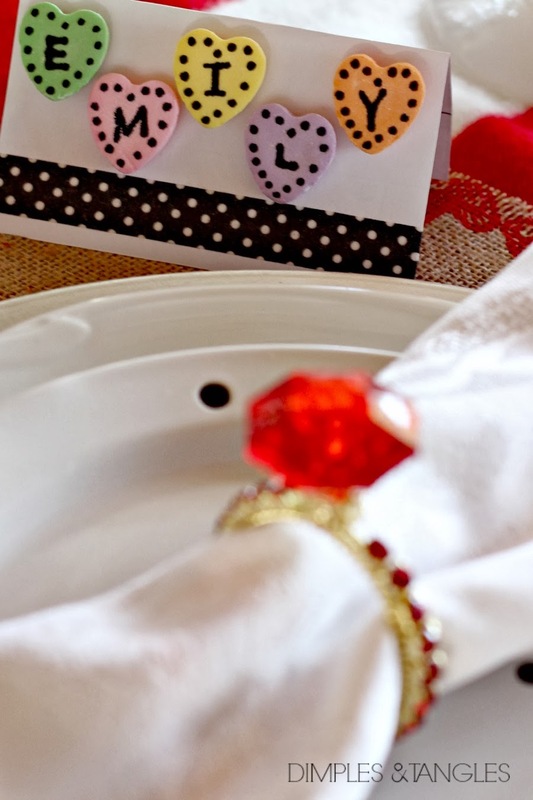 I thought these napkin rings were perfect for Valentine's day! Actually, upon inspection I think they might have been Christmas ornaments, but I bought them on clearance at Hobby Lobby after Christmas last year intending all along to use them as napkin rings. For the centerpiece, I grabbed some things that were laying around the house...flowers, a milk glass bowl for the extra hearts, a disco ball (of course! ), small candle holders filled with more hearts, and a variety of candles. Do you have big plans for the night? I hope you get to spend time with someone you love! Ohhh, I love that burlap! Our JoAnn's is set to open in the next month here so I'll have to be on the lookout for cute things like that! How fun! And very cute that you and your hubby will make the time for a date on Valentine's Day while the munchkins are in school! You always have the best table settings! So fun!!! I love all the cute printed burlap at Joann's. Your place cards are too clever! Enjoy your warm weather! How sweet is that? Love it. What a fun night you will all have! No one does tablescapes the way you do. So so pretty! 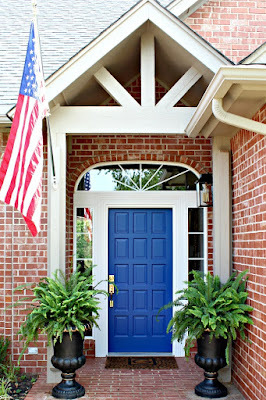 So cute and festive...love it!! 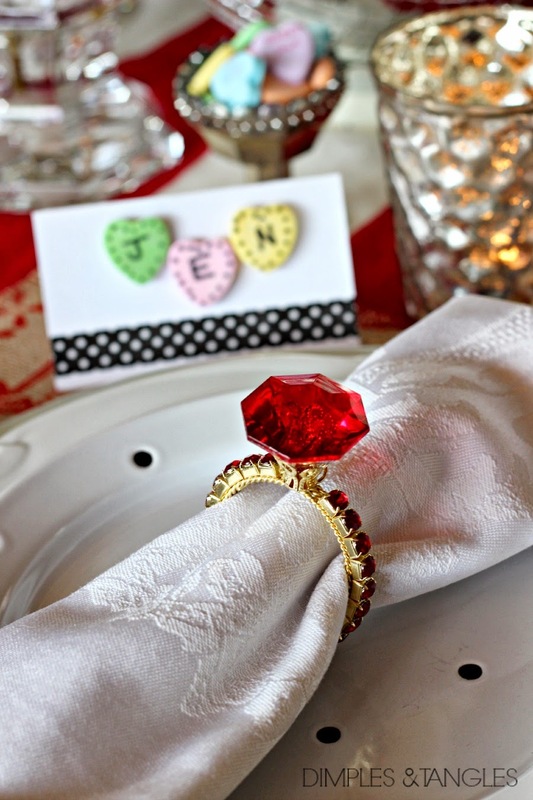 You are the queen of table settings - such a fun treat for Valentine's day! I hope you and your family enjoy it! Such a cute table setting! Our plans are so similar to yours...hubby and I will be having our date lunch tomorrow and then we'll be having a fun dinner together as a family, and probably play games :) Enjoy your celebration!! Us too! Just bought a new game today to give the kids so we can play it tomorrow night. Thanks Cindy! 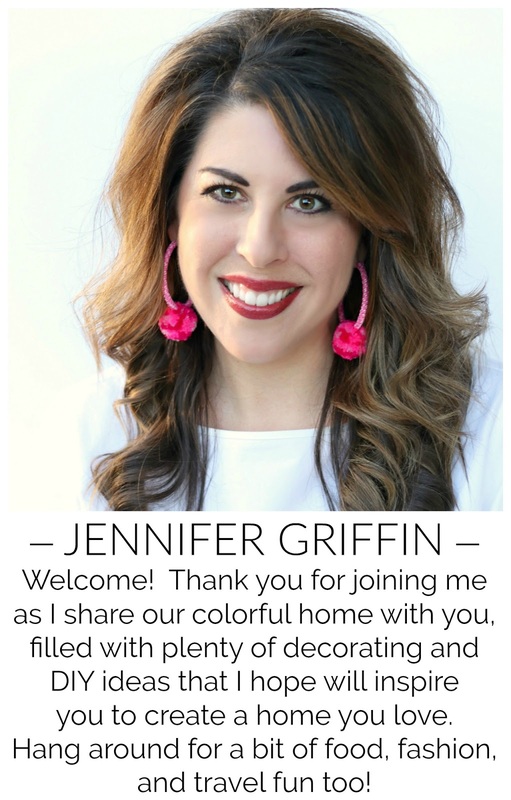 Your table is beautiful Jennifer! My oldest girl's bday is Saturday so our weekend is going to revolve around what she wants to do for her birthday. She has a friend she wants to have over if it suits. If that doesn't work out her dad may take her skating or skiing! What a beautiful table! That fabric is gorgeous! We had big plans for V-day but the hubby drives a snow plow and it won't quit snowing...16 inches and counting! Maybe we will celebrate on a different day! Great job. Your table looks so pretty. Happy Valentine's Day!! 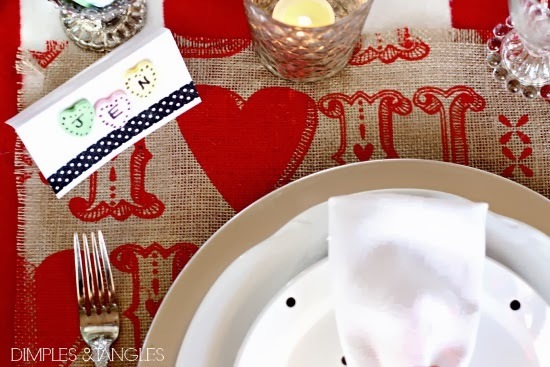 What a great idea to use the burlap fabric as a placemat! 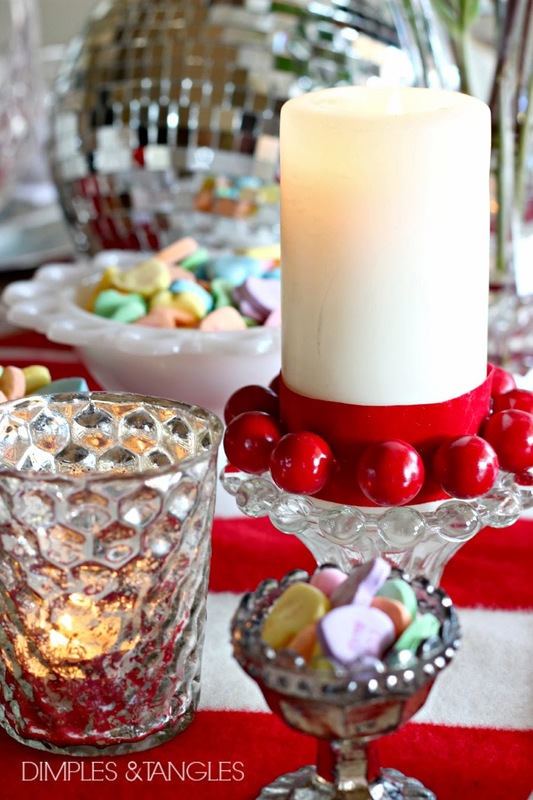 Such a fun Valentines table, the flowers and milk glass bowl are a great addition to the table! How do you think of these things? 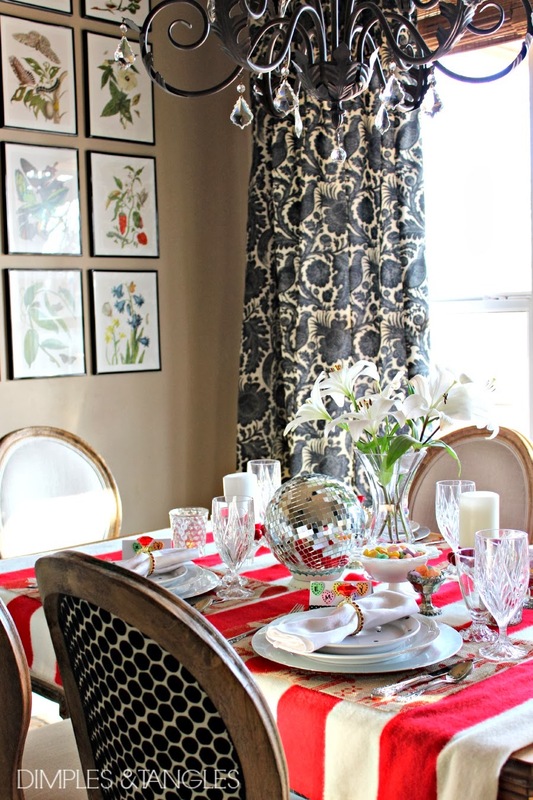 The berries & ribbon are adorable as well as the placemats. Everything looks beautiful & festive. Enjoy your day and evening! so cute and happy! 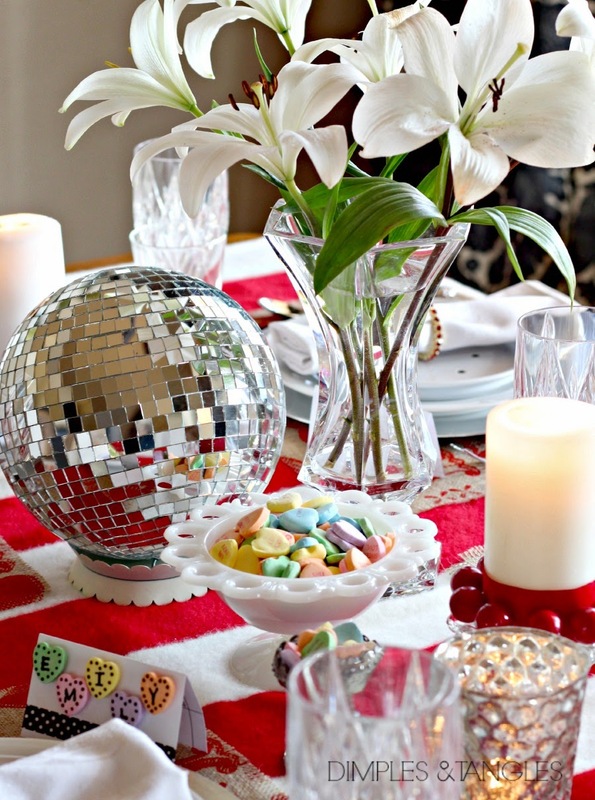 love the discoball! and look who commented two above me! I do a very simple table for my family too!!!!! I love celebrating with all my boys and not just me and hubs, so I try to make it a bit special by setting up a little! This is so cute, love the name tags! I love your table! I kid you not when I saw that fabric at Joanne's I thought of you! I was thinking of cutting it down and framing it such cute fabric! I have such an uneventful evening planned. I'm driving carpool for the teens. Happy Valentines Day. This is a lovely table.